When I was a kid, it seems like because it was such a close knit community - there were always baby showers, bridal showers, and graduation parties to go to. I can remember eating Special K bars, Chocolate Mint Bars, Broccoli Salad, Ham & Cheese sandwiches, and THIS recipe all the time. 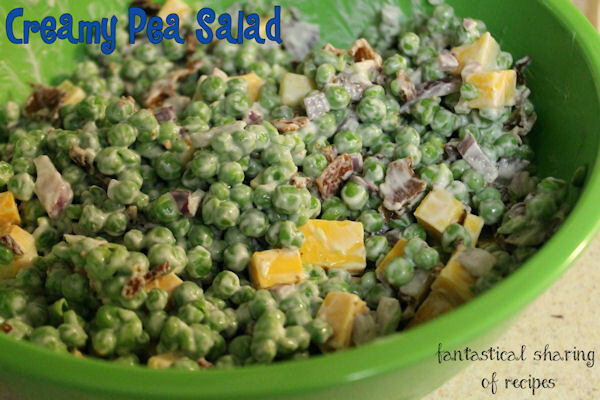 I could sit and eat this pea salad by myself...the whole bowl. I actually intended on having a bunch of this leftover from a Family Readiness Group (FRG) meeting that I brought it to. I thought most people would see just the peas...or just the mayo, but I didn't have one single bite left of this side dish and I was BUMMED. It's got the bite of the onions, the salty crunch of the bacon, and the delicious cheddar cheese. Yum yum yum.